For the above, he says, Rahul Gandhi must be stripped of his Indian citizenship. He also makes a claim about Rahul Gandhi having an illegal undeclared account in Zurich to stash black money, but this point is not backed up by documents. To be fair, it would be extremely difficult for a layman to access such documents, but for the first two allegations, Swamy has strong proofs. 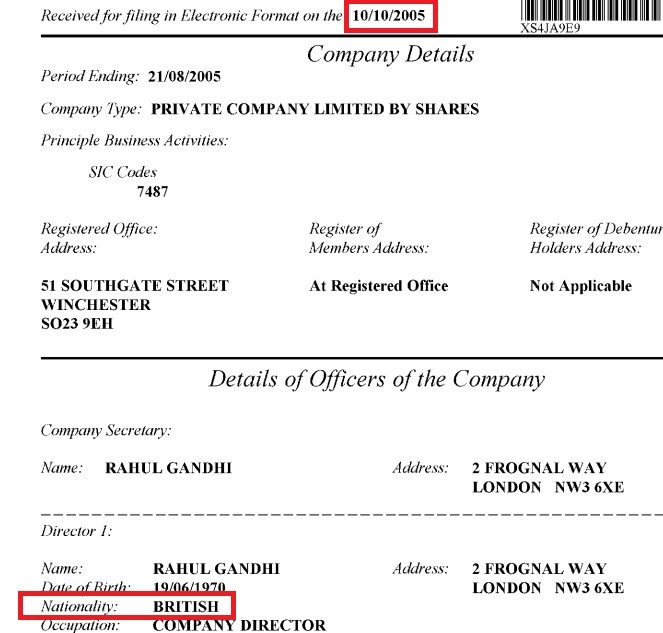 Swamy has dug deep and found that Rahul Gandhi had incorporated a British Company called Backops Limited. The regulatory site for companies in UK indeed shows the company Backops Limited and Rahul Gandhi as one of its Directors. According to Swamy, if Rahul Gandhi had not taken prior permission to set-up this company, it is a violation. The picture gets murkier as we look into the details. In 2003, when the company was formed, Rahul Gandhi declared his nationality as Indian. 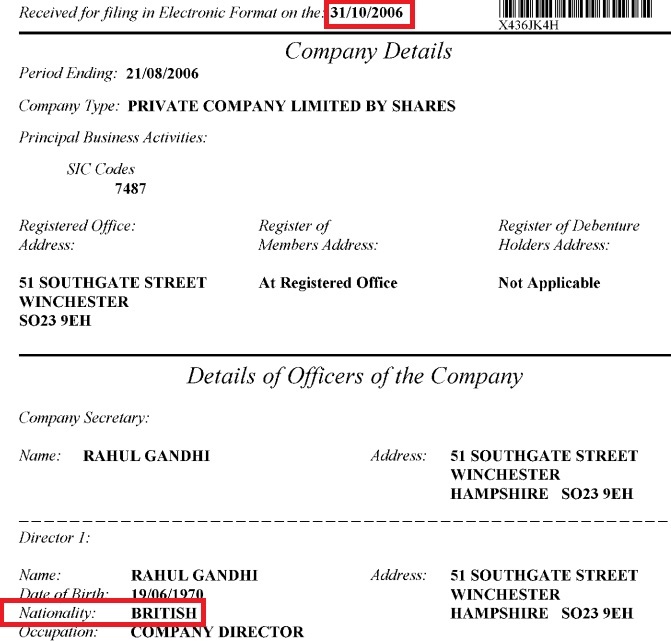 But in 2005, some details of the directors were changed and Rahul Gandhi’s nationality was made British! So how did this happen? Was this an error? Was it deliberate? Did Rahul Gandhi accept British citizenship? Can a company handling the information of such a high profile leader make a mistake? If it indeed it was a clerical error, surely such a mistake can be corrected soon, but in 2006 also, when the company filed their data, Rahul continued to be shown as a British national. Eventually the company was shut down. So did Rahul Gandhi hold two passports at at a time? If yes, he may find himself in a similar position as Devyani Khobragade’s children. Devyani had obtained US passports for her children even as they held Indian passports. The Indian Government, had in its affidavit mentioned that this raises serious questions about her “trustworthiness and integrity”. Rahul Gandhi also does not seem to have disclosed this fact that he was a director in the above company, in his affidavit filed for General elections of 2004. The disclosure made by Rahul Gandhi says, he owns 83 shares in a “firm” called “Backop Services”. Firstly, the term “firm” is not used for a company. Secondly, “Backop Services” by itself cannot be the name of a company, since it has to be appended with Limited or Private Limited. So was there a partnership “firm” by the name “Backop Services”? Probably not. Rahul Gandhi also had an Indian company named “Backop Services Pvt Ltd”, in which he did own 83%, to which the affidavit was probably referring. So clearly, the affidavit only mentions his interests in the Indian company and not the British company Backops Limited. The other director in this company is Mr Ulrik McKnight, an American. Who is he? He is journalist and NYT columnist Sonia Faleiro’s husband. And who is Sonia Faleiro? She is the daughter of Eduardo Faleiro, who has been a Congress politician all his life, and has even been a Union Minister for 5 years. Nothing illegal here, but now we know how Rahul Gandhi might have met Ulrik McKnight. Another interesting angle which comes up is the address which Rahul Gandhi used as his own, for the company formation. In the initial filings, Rahul gives his address as “2 Frognal Way, London”, which is the same address Ramola Bacchan gave, in some of her company filings, but back in 1998. Ramola is Amitabh Bacchan’s sister-in-law. McKnight also used the same address. As we discussed earlier, Rahul Gandhi owned 83% in an Indian company called Backops Services Pvt Ltd. In 2012, it was reported by Outlook that that the registered address of the company led to a chartered accountancy firm and the employees of the firm had not heard of Rahul’s company’s name, and in fact “became a little nervous when queried further.” When they contacted Rahul Gandhi to know more about the same, “he was livid” and accused the reporter “of breaching his privacy and claimed he wasn’t obliged to speak to the media about his private affairs before hanging up”. Shortly, a calmer Rahul Gandhi called back and gave some answers. In 2004, a Deccan Herald report had claimed that Rahul’s Indian Backops company, had landed high value projects, like “construction of International Airport Terminal Building at Mumbai, container freight station for Maersk Sealand, Training Centres for RBI, headquarters of Wochhardt Ltd and Wockhardt Hospital in Mumbai, IPCL township at Nagothane, meditation hall at Osho Commune of Pune”. In his response to Outlook, Rahul also rubbished these claims and said it was a small company. Interestingly, in 2012 itself Swamy had alleged number of frauds done by this company too. In a press conference, he had alleged that this Indian company too had flouted Indian laws and regulations. The progress of this case is however unknown.